Essential oil blends are combinations of pure oils that all work well together to promote something specific like relaxation, energy, happiness and much more. These blends of essential oils can be used for their aromatherapy as well as fragrant purposes. A liberating blend of eucalyptus, ravensara and peppermint that lets you breathe again. Put a few dr..
A stimulating, refreshing blend of peppermint, frankincense and lemon. Helps you through a hectic da.. This sweet, floral mix contains ylang ylang, juniper and patchouli and creates the right ambience fo.. Lavender and tangerine ensure general well-being and relaxation. Lavender is best known for reducing.. 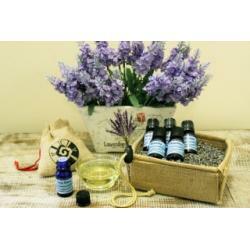 This mixture of lavender, lemon and clary sage helps with stress and tension in everyday life. Laven..
A calming blend of Roman chamomile, clary sage and bergamot that can help with sleep problems. You c..
A soothing blend of Roman chamomile, sage and vetiver grass that can help you relax and unwind after..